Modular Ramps for Home and Modular Ramps for Commercial applications. 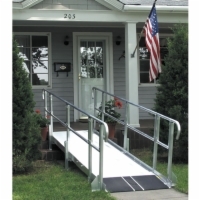 Our all-aluminum modular ramp systems are great for both home access and commercial use. Easy setup, low maintenance, and reconfigurable design all add up to a more versatile, hassle-free accessibility solution for your clients, customers, or loved ones. Call 1 (800) 791-6899 now and start planning for your modular ramp today!